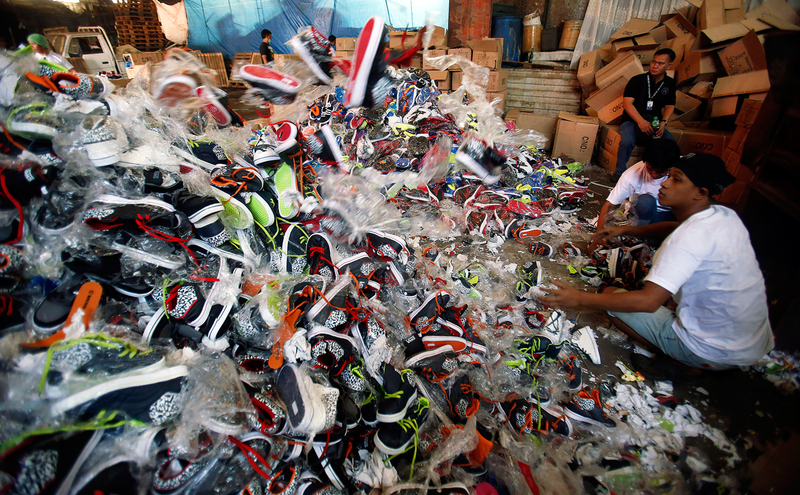 A government statement said over 150,000 pairs of fake shoes and slippers of various brands including Nike, Adidas, Converse, Sketchers, North Face, Leaveland, Merrell, Lacoste, Vans, Havaianas and Ipanema worth $1.13 million, which were smuggled from China. The countries of the Eurasian Economic Union are beginning to fight counterfeit imports with the help of radio-frequency identification (RFID). Starting on January 1, 2017, RFID tags will be used to identify all imported medicine. The announcement was made by Russian Minister of Industry and Trade Denis Manturov at the Anti-Counterfeit 2016 International EAEU Forum, which was held in Yerevan on Nov. 22. Authorities are planning to label consumer goods, particularly clothes and footwear, as well as aviation components and valuable wood, said the minister. The EAEU already tested identifying imported goods in April 2016 when the RFID tags were placed on furs. In 2015, the value of illegal goods on the international market was estimated at $461 billion. About 60 percent of the goods came from China, noted Timur Suleimenov, Minister of Economy and Financial Policy at the Eurasian Economic Commission, at the forum. "China exports consumer goods to Russia that have an annual value of more than $10 billion, yet Russian customs records the import of goods worth only $5 billion," explained Manturov. "That means another $5 billion disappear somewhere and do not go into the nation's budget." According to Manturov, Kazakhstan and Kyrgyzstan have an even bigger problem with Chinese counterfeiting: Chinese exports to each country is estimated at about $3 billion, but official import data say that the value is below $300 million. The EAEU is conducting trade talks with China, in the course of which certain anti-counterfeit regulations are being suggested. However, the main challenge of counterfeit goods is not with China, but rather the absence of traceability within the EAEU markets, believes Manturov. He added that a single Eurasian code is being prepared as one of the measures to fight counterfeit imports at customs. Free trade zone (FTZ) agreements can help in the war against counterfeit imports, notes Veronika Nikishina, Minister of Trade at the Eurasian Economic Commission. "We believe that any civilized agreement is an advantage for us." In 2015, the EAEU signed a FTZ agreement with Vietnam, which included anti-counterfeit measures. Nikishina said the Eurasian Economic Commission plans to seek feedback from businesses on the measures' effectiveness. In the future, this practice will be used for other trade agreements. The EAEU is currently negotiating FTZs with Thailand, Iran, India, Singapore, Egypt and Mongolia. Manturov says that illegal production makes up anywhere from 5 to 30 percent in various sectors of Russia's economy. The biggest sector is in consumer goods, where there is a high level of counterfeit and poor quality items. Inspections carried out by the Russian Quality Service have identified discrepancies in children's clothes and men's shirts imported from China, Vietnam and Bangladesh. "Although 80 percent of the materials was listed as natural, in the end everything was 100 percent synthetic," Director of the Russian Quality Service Maxim Protasov told RBTH at the forum. Protasov asserted that foreign goods packaged in Russia are frequently sold with Russian trademarks. For example, rice from Myanmar or Indian pickles are packaged in Russian and sold under the designation "Russian products," explains Protasov. To identify the brand and the manufacturing country, the Russian Quality Service implemented genetic food product examination (DNA sequencing). Protasov remarks that Germany, the UK, Austria and other countries already use an equivalent process. The Russian Quality Service intends to create a global DNA library for places of origin and soil samples, as well as a genetic base of the various types of crops.